Throughout the 18th century wealthy New Yorkers built grand country estates in the rolling, pastoral hills north of the city. Here during the summer months they could escape to the open countryside where breezes provided a welcomed relief. In 1760, just south of the tiny village of Greenwich, Major Abraham Mortimer built Richmond Hill on land leased from Trinity Church. Mortimer was Commissary to the British Army and an important figure in both military and social circles. At the time, of course, all New Yorkers were British subjects; but that was all to change before long. 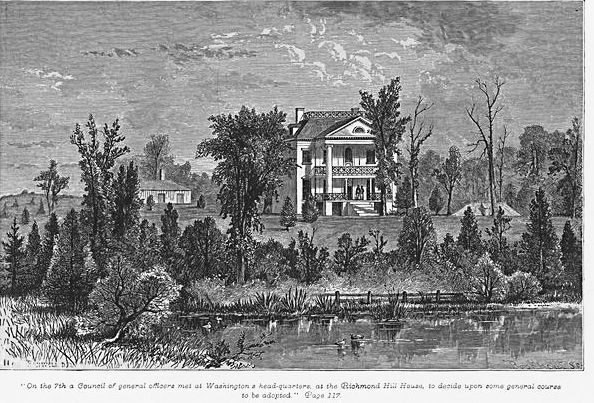 The wooden Richmond Hill mansion took full advantage of the elevated site. Broad steps led to the wide, entrance porch below a columned portico. Chinese Chippendale railings, the zenith of architectural fashion at the time, adorned the balconies and roof. The Major’s “embellishments” of the property and his lavish entertainments here came to an abrupt end as the British army was mobilized against the revolutionaries. On April 13, 1776 General George Washington briefly took over the mansion as his headquarters. During this time Colonel Aaron Burr, aide-de-camp to General Putnam, became familiar with the estate and the beauty of its grounds. While here Washington survived an assassination attempt when Thomas Hickey, one of the general’s bodyguards, was seduced by the British to poison him and other American officers, and to blow up the stores of ammunition. When the housekeeper, daughter of innkeeper Samuel Fraunces, discovered the plot she warned Washington, saving his life. The Revolutionary Army soon marched north and British officers occupied the mansion for seven years until abandoning it in 1783. Mortimer’s elegant mansion sat vacant and neglected for five years as political changes took precedence in the city. Finally, in 1789, George Washington was sworn in as President of the new republic at Broad and Wall Streets. 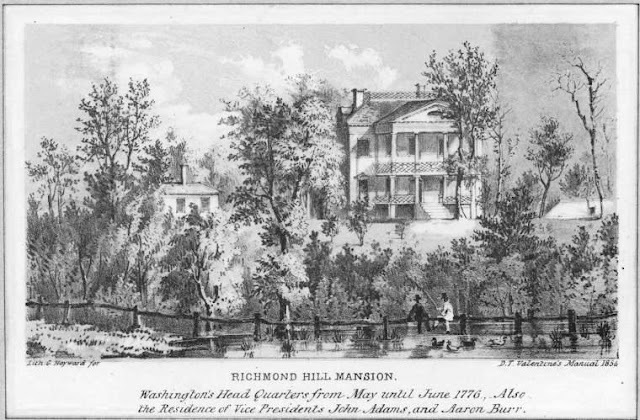 Vice President John Adams and his wife, Abigail, took over Richmond Hill as the vice-presidential mansion. Aaron Burr returned to New York in 1783 to practice law. He was retained by the heirs of Anneke Jans to defend them in a legal battle with Trinity Church. The Jans family claimed ownership of Richmond Hill, most likely assuming that the Revolution had made void any land grants Trinity had received from the Crown. Burr, however, fell victim to his own love of the property and, in return for a long-term lease, sided with the church. Theodosia was a charming and brilliant hostess, even when her father was away in Washington, having become vice-president in 1801. A window-lined gallery displayed Burr’s collection of art and his extensive library was filled with books imported from a London bookseller. But glittering dinners and cultured discussions of literature and politics came to an end in 1804 when Aaron Burr fatally wounded Alexander Hamilton. Negative public opinion regarding Burr forced him to leave New York and his beloved home forever. 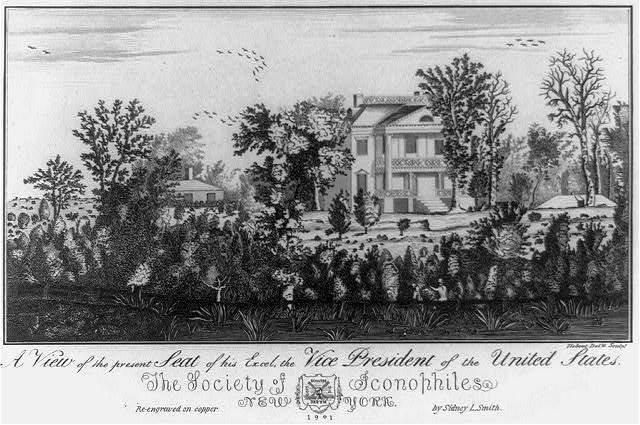 As Greenwich Village spread southward, enveloping the former estate and as brick homes rose along the new streets, the Richmond Hill mansion suffered humiliating changes. Unbelievably, it was placed on logs and relocated 100 feet away to the southwest corner of Charlton and Varick Streets. In 1819 it was home to a circus where the popular clown Charles M’Donald and John May were members of the troupe. Three years later a pleasure garden was opened and became a popular resort for the neighboring residents. Refreshments were served from the mansion. A frequently-offered attraction was a “turtle feast.” But this, too, would pass. In 1831 an addition was added to the rear of the house and it became home to The Richmond Hill Theatre which opened on November 14. Unfortunately for the theater, it was too far removed from the established city to attract a sufficient audience. The management changed its direction, offering Italian Opera and bringing in esteemed names from the European stage. The theater struggled on for nearly ten years, finally closing for good in 1842. For a short time it became the Tivoli Gardens, then the National Theatre, and in 1846 became the enlarged New Greenwich Theatre. The ever-failing venue tried, in vain, a last stab at opera, opening and closing as the New York Opera House in 1847. 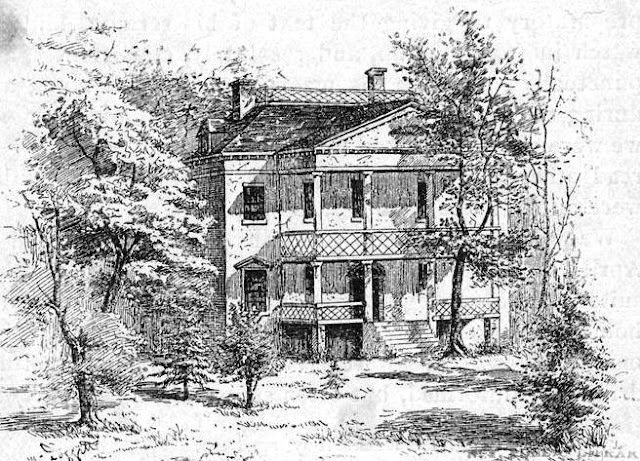 After the failure of the opera house, the disgraced mansion suffered as a roadhouse and saloon until 1849 when the property values outweighed the historical importance of the house. That same year the venerable, if degraded, Richmond Hill was demolished and in its place a row of quaint brick houses arose. Unfortunately, it all came too late for the elegant home built by a British Major, was headquarters to both the Revolutionary and British armies, and was home to two United States Vice-Presidents.